New Zealand artist Rosanna Raymond in an incarnation of tusked Pacific womanhood. Photo courtesy of Rosanna Raymond. (NEW ALBANY, Ind. )–IU Southeast welcomes trailblazing multimedia artist, performer and thinker Rosanna Raymond to campus for a workshop and two public lectures exploring her complex and dynamic vision uniting traditional elements of the Samoan world-view with forms from the creative edge. Raymond’s presentations are unpredictable, provocative, powerful. They combine a visceral visual impact with unflinching social and political analysis. The result is an ultimately cathartic experience for both performer(s) and audiences. 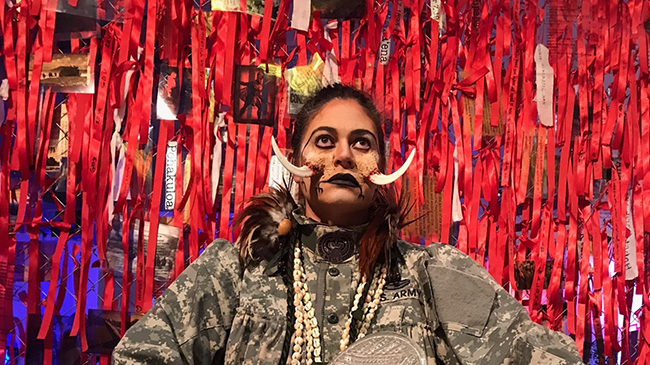 “Rosanna’s work fits at the intersection of culture, identity politics, colonialism and the growing importance of the Pacific,” said Anne Allen, professor of fine arts and co-director of international programs. Allen, who edits Pacific Arts, the journal of the Pacific Arts Association, has been friends with Raymond for over a decade. Her own work in the art of the Pacific, focusing on village architecture, performance and the use of space in Samoan village architecture, makes Raymond’s oeuvre particularly interesting to her. Space is at the heart of Raymond’s creative vision. Even her most basic self-definition begins here: “I fabricate, articulate, culti.VA.te and acti.VA.te spaces,” Raymond has written. That space might be a physical one, such as her own body. Growing up in Auckland, New Zealand, as a Pacific Islander of mixed ethnicity, Raymond was made acutely aware of her “otherness”—her non-belonging in either white or Maori society. She became involved with Pacific Sisters, a group of artists, costumers and photographers that spawned a multi-cultural style known as urban pasifika. Her desire to imprint herself with a history, to establish a place in the world for herself, expressed itself through tattoo, clothing design, adornment, dance and performance art. To distinguish herself further from the European stereotype of the exotic “dusky maiden” of the South Seas, Raymond created alternative identities. In Full Tusk Maiden, a performance piece, she appeared a ferocious posture flashing blood-red palm fronds and a warlike mien. Exploring the space of personal manifestations: a Rosanna Raymond in a masked incarnation. Photo courtesy of Rosanna Raymond. But space might also be the faux 19th-century gentleman’s club she conjured in her 2008 installation, “SaVAge K’lub,” where contemporary pasifika culture, Victoriana and tiki-torch kitch cohabited an environment that expressed her multi-layered experience of inhabiting Pacific reality. Here meticulously sourced artifacts, such as a rare feathered cloak and an outrigger canoe, are presented against a pop-art pastiche of island print patterns that ultimately becomes a commentary on the institution of the museum itself. Or space could be interpreted more metaphorically, as a distance that is not empty but filled with dialogue, exploration, conflict, negotiation, puzzlement or understanding. In this way, it might be the space between truth and representation, between western cliches and Pacific realities, between who we really are and how we conventionally represent ourselves. The space between dusky and tusky. Between tradition and modernity. The awareness of space as a relationship between fluid forces rather than a void between static dualities, makes Raymond’s work dynamic with an air of the improvisational. Allen considers Raymond’s art relevant to today’s concerns, and her appearance at IU Southeast timely. From Standing Rock to Black Lives Matter, there is a struggle for recognition and justice on the part of disadvantaged ethnicities, and Raymond’s work can serve as an example of how the arts can speak out..
“Rosanna and the Pacific Sisters created a metaphoric space where they could express and celebrate their heritage and identity as women, Pacific Islanders and human beings, providing a model for our students to do likewise,” Allen said. 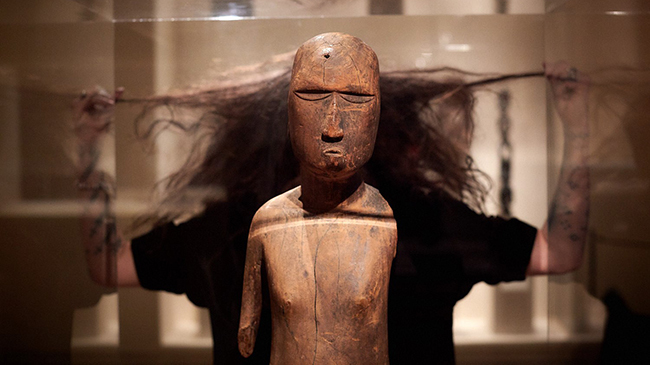 Students will enjoy a rare opportunity to interact with an artist of international renown who is still blazing trails both in her creative work and in her consulting relationships with collections, such as the British Museum and the Metropolitan Museum of Art, that are striving to be more innovative and respectful of Pacific holdings. “Her blending of performance, poetry, installation, costume and fashion design will help our students, who mostly focus on the more permanent forms of art, to expand their thinking and their work,” Allen said. Homepage photo courtesy of Rosanna Raymond.